I’m in my 30s. Why should I plan for retirement? Life is good. Work’s beginning to pick up and you’re finally beginning to enjoy the fruit of your labor. Those little luxuries that were once beyond your grasp can now be bought comfortably. The money crunch is slowly beginning to wear off. So why should you even think of retirement now? 1. The earlier you begin saving towards your retirement fund, the easier the financial burden will be later on in life. 2. Things aren’t getting any cheaper, so every penny squirreled away goes toward a more comfortable retirement lifestyle. There’s a myth that you need to set apart a large sum of money every month towards that retirement fund, but this is so far from the truth. Start saving at least 10% of your monthly income for your fund. Some companies even match those savings so yes, check and see if your employer does that. 2. Don’t invest all your spare funds into one pool. Make smart investing decisions by investing a little into reliable investment channels that make your investments grow. 3. Don’t live for today! Now this doesn’t mean you hold back from enjoying life today but it does come with a small disclaimer to live life with its comforts but not too lavishly. Don’t splurge on unnecessary, unjustified expenses. You will see how the money saved will make that difference in your lifestyle, several years down the line. This is definitely a financial plan that can be attained! 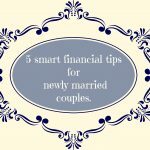 5 smart financial tips for newly married couples. 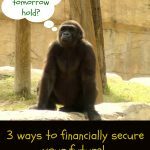 3 ways to financially secure your future. Previous Post: « Get smart! Use Healthgrades and choose the right Medical Practitioner. 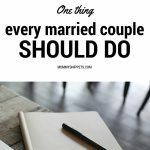 We began planning in our 20’s. Of course, the company my husband worked for went bankrupt and kept a ton of our funds so we had to start over. Sigh. I think way, way ahead so I’m always looking towards the future. I agree that it’s important not have all your investments in one place. I will turn 30 this year and we started our retirement savings earlier this year. It is REALLY important!! It is never too early to start, as soon as I turned 30 I started really saving. I agree that it is never too early to start! 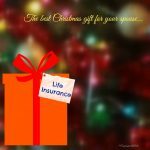 You never know what can happen and it is so much better to be prepared! I think a good thing to point out is to not count on your job’s retirement fund option. We did. And then the husband ended up changing jobs and now all that money we put away with the company he was working with is now gone! We don’t get to take it with us when we changed jobs. And now we have to start all over again. 🙁 Definitely start saving in your own accounts not attached to your job. Great advice. I stated planning late and feel like I should be catching up always. As a former stockbroker, I can tell you how important this is. Starting is the first step! So many people put it off because they are afraid to begin. Great article! I have yet to think about my retirement. BUt great points thanks for opening my eyes. We have definitely begun discussion on planning for the future, but unfortunately we are finding it difficult just trying to afford the now. Thanks for this post and information! Great advice. It’s never too early to start planning for your future. my dad emphasized early planning with each of us. i feel fortunate. it’s all so uncertain, with the economy and the government. We have to plan well!! our world has too much living for today and not enough vision for the future. This is a great reminder! I’m starting to save, but I need to invest my savings in ways that make it grow! This is something I am always thinking about too! 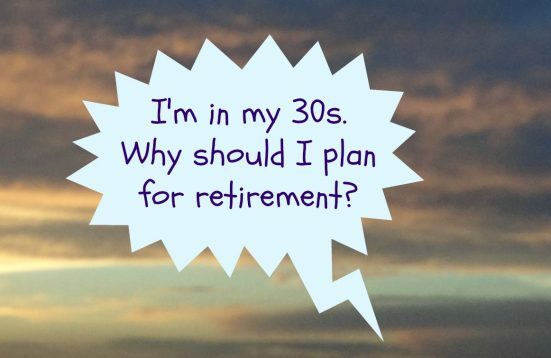 Great advise… we are in our thirties as well and already started our retirement plan and we talk about it a lot… it sounds like 30 more years is sooo far out.. but in the blink of an eye it will be here and then what…. be prepared.. thanks for sharing a great post.